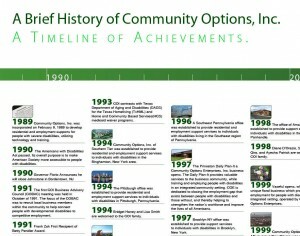 History | Community Options, Inc.
Community Options, Inc. was incorporated on February 9, 1989 to develop residential and employment supports for people with severe disabilities. Since its inception, Community Options has been devoted to serving individuals with intellectual and developmental disabilities, thus cultivating a reputation for providing exceptional person-centered services that are unique to each individuals’ needs. With a mission to develop housing and employment opportunities for people with disabilities, Community Options believes in the dignity of every person, and in the freedom of all people to experience the highest degree of self-determination. Throughout its history, Community Options has participated in institutional closure and community residential placement for thousands of people across several states. As a national agency, COI does not administer any large programs; rather, we recognize that people with the most severe disabilities require environments, equipment, clinical staff, and supports that are individualized and tailored to their specific needs. COI programs and services include community-based living, employment supports, high school transition programs, and specialized programs for respite and medically fragile people with disabilities. 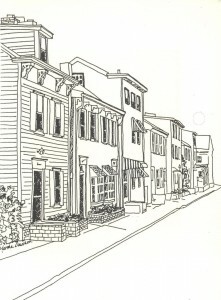 The officers, management and staff of Community Options have many years of experience in providing community based residential and employment support to people with developmental and intellectual disabilities such as Autism Spectrum Disorder, Cerebral Palsy, Down Syndrome, physical disabilities, traumatic brain injury and dual diagnoses. The agency has developed an expertise in working with state and county based authorities to facilitate community placement for persons moving from institutions, as well as transitioning from their family home. This expertise includes the utilization of national staff to support locally recruited executive directors in submitting individualized service plans, locating and securing appropriate homes, condos and apartments, and recruiting and training experienced staff. Community Options has a vast network of experts and consultants in the field of intellectual and developmental disabilities to assist staff in designing and operating services that meet very specific needs. Community Options contracts with various government entities and is supported by dedicated staff in programs throughout several states: Arizona, Kentucky, Maryland, New Jersey, New Mexico, New York, Pennsylvania, South Carolina, Tennessee, Texas and Utah. Additionally, the organization is experienced in providing International support services in Europe, South America, and the Middle East. Community Options is a registered Private Voluntary Organization with USAID.